Note: This article is about the Trooper Militia. You may be looking for the Galactic Federation Marine Corps, the branch of military that houses the troopers. Galactic Federation Marines are the standard trooper militia of the Galactic Federation Military. The Marines consist of many classes, each with different attributes. 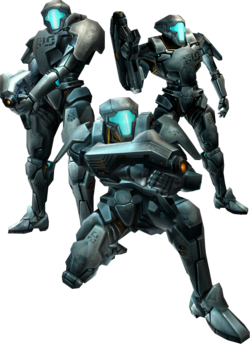 Their basic uniform is a heavily armored metal suit, designed much like the Power Suit. The Marines' weaponry is varied greatly, although the majority of the troopers carry a standard Arm Cannon. The main purpose of the Marine's deployment is to render Space Pirate forces. The Marines are shown to consist of either gender, as shown by Specialist M. Angseth. The standard Federation Trooper is the basic form of Marine. The class consists of armored soldiers that are trained for combat. They are outfitted with metal suits and a special type of arm cannon that fits over the trooper's arm. The cannon is a rapid-fire assault cannon for use in combat. The troopers hold their own Logbooks where they can store personal entries. The standard Federation Trooper must stand to higher-ranked members of the Marines. There are nine known ranks into which the standard troopers are divided, those being Captain, Commander, Lieutenant Commander, First Lieutenant, Gunnery Sergeant, Sergeant, Specialist, Lance Corporal, and Private First Class, as demonstrated by the GFMC Task Force Herakles that served aboard the G.F.S. Tyr. 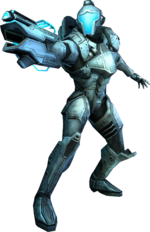 A PED Marine is a standard Federation Marine with Phazon Enhancement fueled into their weaponry by an external backpack. This gives them extra boosts in firepower as well as a different look. 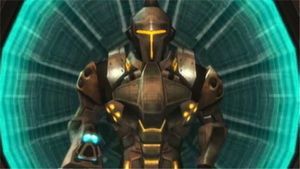 They have only appeared in Metroid Prime 3: Corruption. A Demolition Trooper before he plants an explosive. A Demolition Trooper is a Federation Trooper that carries large explosive materials that can destroy many different materials. They only appeared in Corruption in the Pirate Homeworld to grant Samus access to the planet's Leviathan. With these destructive materials however, the Demolition Trooper has a very small level of firepower. The 07th is a platoon of federation soldiers led by Adam Malkovich that appears in Other M. The official class of these soldiers has been debated over by fans, but a final verdict has not been decided. Federation Marines wear advanced suits of powered armor, allowing them to use potent weapons and resist heavy damage in battle. Few can match them in combat. This page was last edited on 10 August 2013, at 16:51. This page has been accessed 25,418 times.